Suited to your needs? Absolutely! It's the very definition of vacation living. Neighborhood? Bet your bottom dollar! 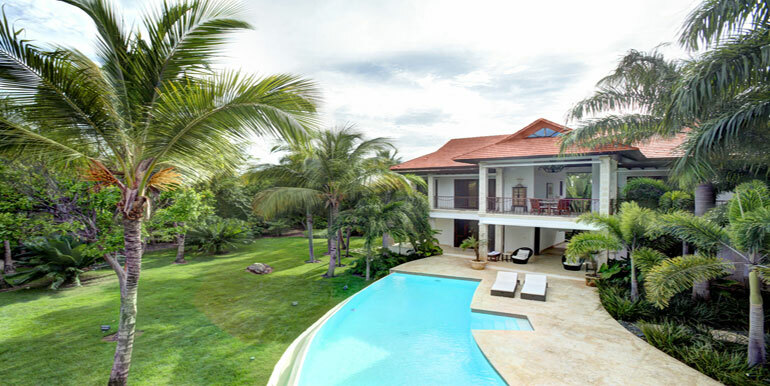 It's right on the golf course, a 5 minute walk to your private beach, and only a 5 minute drive from the Punta Cana airport. The right appearance and feeling? You can bet your life on it too! It's a stylish villa that feels relaxed, happy and cheery. Just like your home. Number of rooms? Check! It boasts 5 bedrooms in all, as well as ensuites to all bedrooms. And great features? Lots of those to be had also, including a secluded backyard, lowest rental price in the neighborhood, gated community, infinity pool, integrated indoor & outdoor areas, light and airy design, magnificent condition, oversized bedrooms, and a quiet cul-de-sac location. At only $1,100 per night, and with such an array of features, this villa won't be available for long. Don't be too late. Call 809-848-6791 now to schedule your vacation in Punta Cana. Great location the house is as described in the listing, picked up from the airport and able to add chef services for a small additional fee. Beach is near by and the pool at the house is great. The golf cart is a nice feature, also an additional fee. Thanks so much for sharing! It was a pleasure to host you. This house was perfect for a tropical family vacation. Minutes walk to nice beach/beach club with food, large pool, etc, and privacy. House staff was excellent-- great food and service. Lots of other amenities golf cart ride away, including horse back riding and hiking through a nature preserve with nice secluded beach and lagoons. Would definitely recommend. Also, Dahiana went out of her way to make everything right for us-- recommend doing business with her. You and your family are welcome~ ! It was an HONOR to host you Marlene! Mil Gracias !